Bellbirds & Pea Shoots: Inspiration from Joel Salatin: Part 2 - Why Are We So Slow? Inspiration from Joel Salatin: Part 2 - Why Are We So Slow? Today it takes up to 10 calories of oil to produce one calorie of food. Joel Salatin from the US, heralded as the worlds most successful farmer, was in Sydney recently where he gave an illuminating talk. By uncovering the inefficiencies of our chemical food system he offers us a better way to treat the land and ourselves. Inspired, I consider how these ideas can be applied on the household level in part 2. Salatin, a self-described "Christian-libertarian-environmentalist-capitalist-lunatic-farmer", is not afraid to challenge the norm. A third generation alternative farmer, he has built on his family's work to develop Polyface Farms into an innovative "beyond organic" meat producer that has featured in countless media including the documentary "Food Inc". On his 550 acre Virginia farm he produces beef, poultry, eggs, pork, rabbits and forestry products. This is sold by direct marketing to over 5,000 families, 10 retail outlets, and 50 restaurants, all within a 4 hour drive of the farm. Salatin believes there is strength in keeping money in one's own community which encourages decentralisation. The "orthodoxy" says that we will grow genetically modified food, and that our food will be irradiated for safety. The orthodoxy also once said that the earth is flat, that the black death spirits will kill you, that blood letting will make you well, and that we will feed cows to cows. Today the orthodoxy says that it is illegal to feed cows to cows. Joel Salatin has taken the stage and announces that he has his PHD, his Post Hole Digger. As a farmer that makes more income per square meter than that of orthodox farms, it seems he is well qualified to speak. Salatin commands the presence of a preacher. We have a new time of what is orthodox and what is heretic. Louie Pasteur is famous for his experiments that became the basis of the theory of modern medicine. His experiments supported that infectious diseases are caused by microorganisms. Antoine Béchamp, Pasteur's predecessor, proposed an alternative, that a diseased body, the "terrain", left poorly defended, will be scavenged by opportunistic germs. He viewed that the PH balance of the body formed an important aspect of the strength of one's defenses, and that germs are not the cause of disease. This became known as the "terrain theory". Today a sick animal is viewed as "pharmaceutically disadvantaged". Salatin considers the alternative "What did we do to breakdown the terrain to allow that animal to get sick?" Organic farms do not use pharmaceuticals. The neighbours may see this as "bio-terrorism". 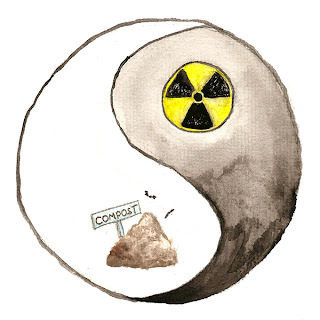 At the time the atomic bomb was introduced "scientific areobic composting" came about. Talk about ying and yang. An experiment was later conducted, where known foot and mouth carriers were fed on chemically fertised feed. Other known carriers were fed on feed fertilised with aerobic compost. The cows fed on the naturally fertilised feed became free of foot and mouth, those fed on the chemically fertilised feed made no improvement. Dietary deficiency was the cause. Orthodoxy equals annihilation. In today's orthodox system of barns and cages, chickens are not chickens. Salatin asks "How do we allow the chicken to express its chickeness?". Choose free-range organically certified products. Avoid caged, or feedlot produced meats. Avoid synthetically fed fruits and vegetables. Spend time in the sun, breathe fresh air, exercise, eat well and get adequate sleep. Use natural, chemical free cleaning products in your home, such as vinegar and bi-carb soda. Use natural cosmetics and personal care products. Choose herb and plant based remedies to treat ailments.